Hello! Not done one of these in a while so thought I’d make some improvements! This is my new format of Style Crush post, and this week’s crush is the gorgeous Diana Vickers, partly because she released her album today, which I have bought already and absolutely love! I’ve chosen the outfit she wore recently when she was spotted arriving at Radio 1 as the colours are gorgeous and its such a perfect Spring outfit. This week I decided to choose Topshop to replicate Diana’s outfit. 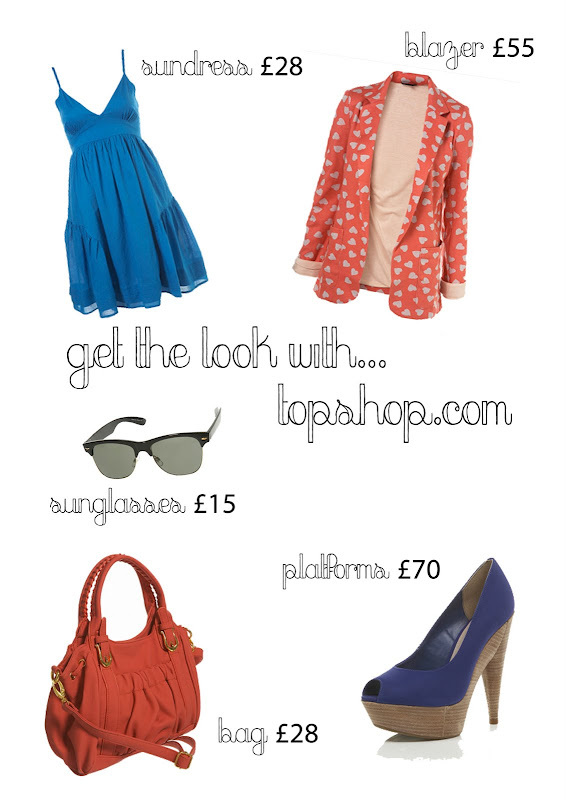 I’ve gone for a heart print blazer in similar colours to the polka dot one Diana is wearing, and a basic blue sundress. The sunglasses she is wearing are Ray Ban Wayfarers, but I spotted some really cool rimless ones for just £15. Finally I’ve picked a coral slouchy shoulder bag and some navy blue wooden platforms to complement the dress and blazer. What do you think!? All items can be found at Topshop.com. Let me know if there’s anyone you’d like to see as next week’s Style Crush, or any shops you want me to find the garments from! Hope you’re all having a great Bank Holiday Monday! I had to work this morning, but now I’m off to relax with ‘500 days of Summer’ on DVD. Oooh yes, she looks gorgeous! Love the polka dot blazer. Oh god no. I cannot stand the girl ugh. That Topshop bag is laverly!